Fungus Free Skin and Nail Puremedy is a formula created to eradicate fungus on the foot. It contains neem, oregano and tea tree oils to ward off bacteria and fungus, to restore balance to the skin. The website states that Puremedy has proven anti-fungal and anti-bacterial properties, is an anti-inflammatory and uses 100% natural food-grade ingredients. In addition, it states it is both nourishing and healing. 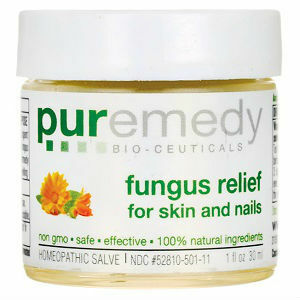 Fungus Free Skin and Nail Puremedy comes in a jar with a screw top lid and a white label on the front. In order to see if Puremedy lives up to their claims, I did some extra research. The ingredients listed here certainly seem to back up Puremedy’s claim for Fungus Free Skin and Nail Puremedy to be 100% natural, which is good to know. The website recommends you apply Fungus Free Skin and Nail Puremedy 2 to 3 times daily as needed, and if needed, the user can cover the area with a band-aid afterwards. Though, it does not state how long someone should use the product. On the website a 1 ounce jar of Puremedy costs $15.95, while a 2 ounce jar is $29.95. If you were to apply this to the affected areas 2 or 3 times per day, I should think it is more than enough for one month, making Puremedy quite well-priced. I was able to find Fungus Free Skin and Nail Puremedy on many different websites as well, where the price started as low as $10.39; so it may pay to shop around if you intend to buy it. While the website itself did have many testimonials from happy customers, I could not see one specifically for the Fungus Free Skin and Nail Puremedy lotion. However, I was able to find some reviews on Amazon.com where they were all very complimentary to the product and claimed that it had cleared up both nail and skin fungus with no irritation to their skin while doing so. The website itself made no mention as to whether or not they offered a money back guarantee, but this also varied across different providers. So if you wanted the security of a money back guarantee, by shopping around I’m sure you can find that option. Fungus Free Skin and Nail Puremedy lives up to its 100% natural claim with the long list of ingredients in their product. The price is very affordable and the dosage seems sensible and possible. Though it does not tell us how long we should use the product for. The testimonials I could find were complimentary but also few in number, so those may not be a completely representative sample. Jack Stevens	reviewed Puremedy	on February 20th	 and gave it a rating of 3.